The Sam4s Giant 100 is the latest in Thermal Receipt Printing from Sam4s. The new Sam4s Giant 100 with 'Drop & Load' printing and the ability to include Barcodes & Graphics is the first choice for your business. Multi Interface – Serial, USB & Ethernet as Standard. Energy Star Certified – Superior Efficiency Reduces Energy Costs and Carbon Footprint. 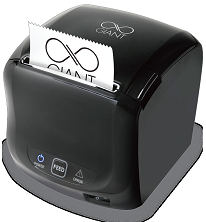 Click the button below to add the Sam4s Giant 100 Thermal Receipt Printer to your wish list.